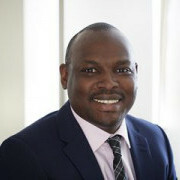 Mr David Ogutu graduated from medical school in 1999. His specialist training in Obstetrics & Gynaecology was at the Royal Free Hospital and North Middlesex University Hospital, followed by advanced training in Assisted Conception, Reproductive Endocrinology and Laparoscopic Surgery at King’s College Hospital, London. He is a Consultant Obstetrician and Gynaecologist at North Middlesex University Hospital and a Fertility Specialist at Herts and Essex Fertility Centre (HEFC).